A fly fishing journey across Finland. Finland is a small country of 5.2 million residents and thousands of lakes, located next to Sweden in Scandinavia. Our beautiful country has a lot of potential for fly fishing across the country, since the waters are easily reached. No matter where you live, there is always a lake or two next to you. 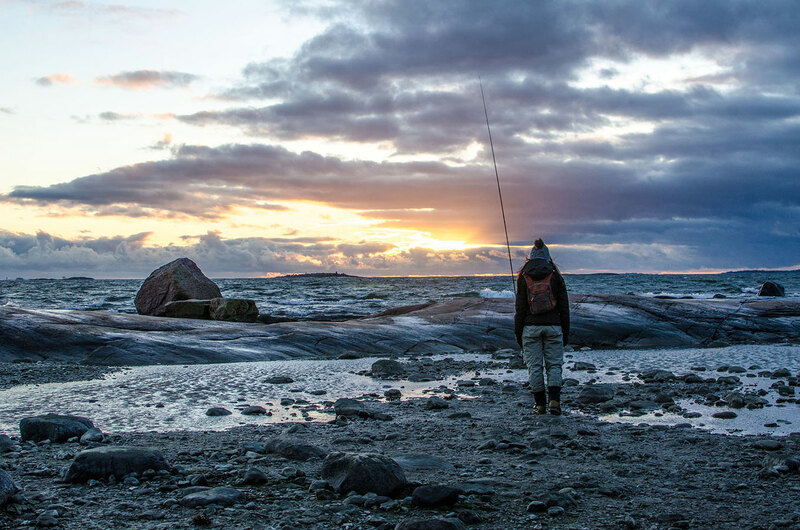 Even though we have four amazing seasons for fly fishing, Finland still isn’t as familiar a fishing destination as our neighbor countries, Sweden and Norway. We would now like to introduce some of our favorite fly fishing opportunities in our homeland. There is a good reason why Santa Claus lives in Northern Finland, Lapland. Nature offers the best gifts by the riversides and peaceful lakes in the wilderness. 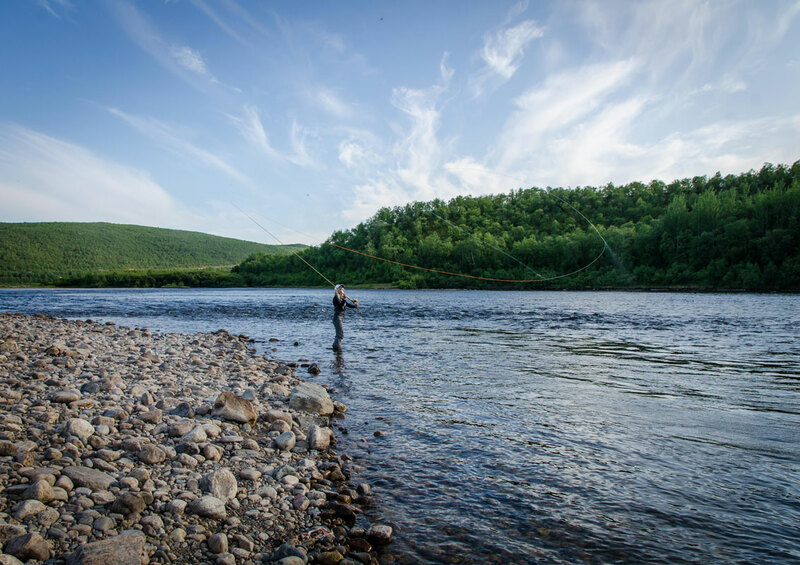 You wouldn’t like to try fly fishing in Lapland during the long, snowy and dark winter, but Lapland’s summer is phenomenal. How about fishing in sun light in the middle of the night? Taking pure and fresh drinking water straight from the rivers that flow from the arctic hills? And what could possibly be more delicious than a raw pickled fish with crispy bread for breakfast! Fly fishing in such a great environment is a real adventure. Midnight sun and true wilderness in Lapland. Some of the most easily reachable places for fly fishing are located next to the little villages or roads, but the further you hike, the better fishing you will find. After a few days of hiking, you will find lots of lakes and rivers which are very peaceful and it’s not likely you will meet any other fisher at the same spot. You could easily spend weeks in the wilderness without meeting another person. If you’re not keen to walk, you can always pay for a helicopter pilot to fly you there and back. When considering spending time in the wilderness, make sure you have survival and safety skills for tough and quickly changing weather conditions. Keeping yourself warm, knowing how to make a fire even in wind and rain, orienteering and knowledge in first aid are some basics you would need to know. The most interesting fish in Lapland are salmon, grayling, trout and arctic char. And, don’t forget the pike in the wilderness. They are some crazy fighters! As anywhere else in the world, the best places to hunt big fish are well kept secrets, but you can quite easily target your fishing for a specific species: arctic char at the upper highlands, grayling at the lower highlands and trout somewhere in between. 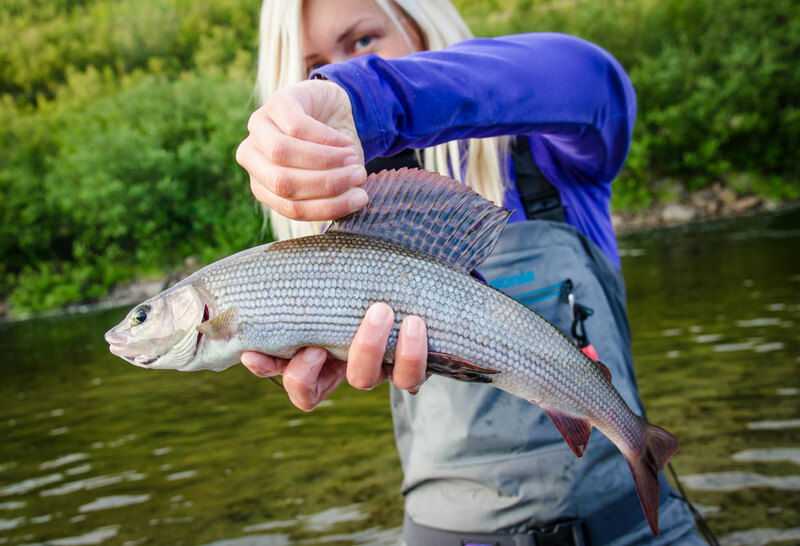 The most common catch in the wilderness area might be grayling. If you’re into salmon fishing, you could head to the Teno River, which is our boundary river with Norway in the very north of Finland. There are two different Atlantic salmon runs in Finland, one from the Arctic Ocean in the north and another from the Baltic Sea in the south. Depending on the river, you can fly fish for salmon from June to September. 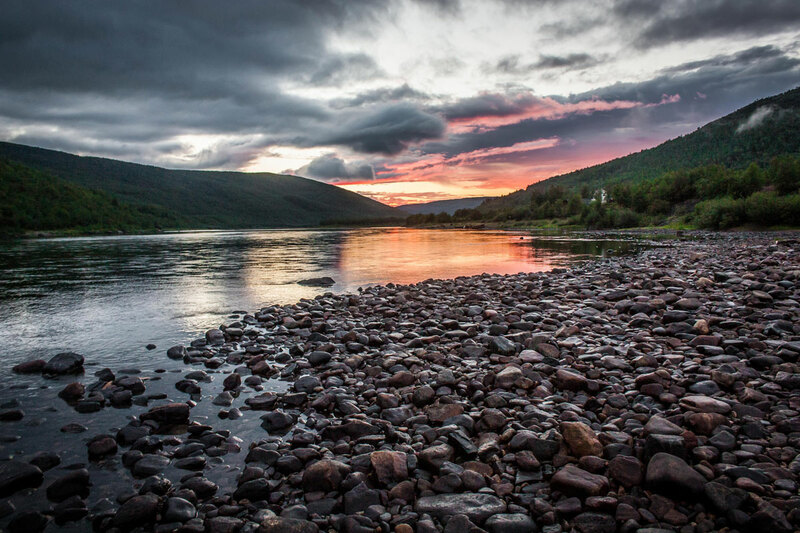 The Teno River is over 200 km long and probably our best known salmon river. As the salmon start to migrate from the Arctic Ocean to the river in the summer, the river valley starts to fill with enthusiastic fly fishers from all over the country. Watching the massive migration is a very impressive experience! Besides the rivers in the north, there are interesting salmon rivers in southern Finland. The salmon stock in the Baltic Sea became endangered in the 20th century because of the dams built in almost every river. The fight is still going on and we have lots of work to do, but we are on the right path now. Some rivers are showing good results with fish ladders and improving spawning habitat. The salmon that migrate from the Baltic Sea are bigger than the Atlantic salmon, which is a one good reason to give these rivers a try. Fly fishing for salmon is not the easiest way to catch a fish, but because it is challenging, that makes it even more addictive. After fishing for days without a single bite, the feeling is indescribable as a salmon finally takes your fly! In the land of thousands of lakes (by which we actually mean no less than 56,000 lakes), there are almost 650 rivers, so there is a lot to choose from. Every one of them is different and provides a variety of opportunities and challenges. Our rivers have a fascinating history and most of them are really close ,either to magical Finnish forests or the historic milieu of little villages with old and absolutely beautiful mills. Every village and every river has a story of its own and local people enjoy telling them. In Central Finland, life seems to turn easy and relaxed, as the people around you are friendly and helpful, nature is close and you can feel it. You find peace and silence with only you and the rapids, but also great company if you want. Watching a peaceful river view, listening to a loon singing and breathing the fresh forest air, that’s the way to feel the real culture of Finland! Traveling to Central Finland is a easy getaway from the city life. Furthermore, river fishing there is an easy way to experience DIY trips. Most of the rivers are not large and there is enough information available to fly fish without a guide. There are also many places for urban fishing because many rapids are close to the cities or they flow through them. You don’t even need a car to go fishing. Most rivers are close and you can easily drive from one rapid to another. When taking a break from fishing, you can relax in a sauna at one of the many accommodation options or swim in a river or lake nearby. If you’re more into camping, the ”every man’s right” basically allows you to camp occasionally nearly anywhere you like, unless you are thinking of putting your tent at someone’s backyard. Even though the population of native brown trout is not robust in our country at the moment, as a result of bad choices in the past, there are still good opportunities. Today some rivers are protected with tight rules and restrictions to keep fishing pressure low. Thanks to responsible and selective fishing styles, there are still great possibilities for brown trout fishing in Finland. Furthermore, we have a variety of many other fish species here. Lately, zander has attracted more attention among fly anglers and there are some good rivers and rapids in Finland where zander rise for eating during the summer nights. 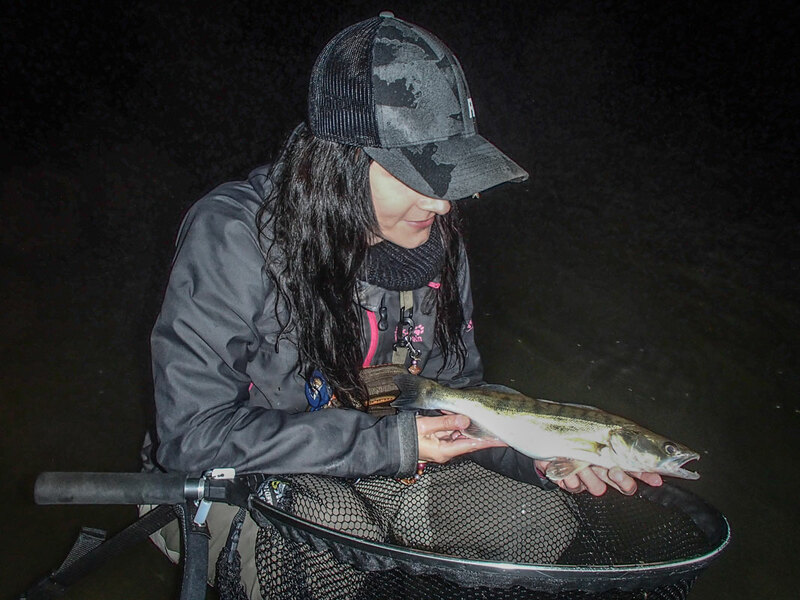 Is there anything like wading in the darkness and looking for a zander under the moonlight? Also, fishing for asp is a good option, as a big and powerful asp gives a great fight on the rapids. At most of the places the best season for asp fishing is spring, but there are also a few places where asp stay over the summer. When the leaves turn to yellow and red, fly fishers living near the coast start smiling, because the big pike hunt is right around the corner. When all the normal people get back to the cities from their summer cottages, get their boats to the dry land and start waiting for the next summer, pike anglers prepare their boats or ‘bellyboats’ for autumn; their favorite season. The coastline in Finland is quite long and there are many different areas for coastal fishing. The Baltic Sea has brackish water and the salinity decreases the farther north you go. One very interesting place to discover is the Kvarken Archipelago in the west coast of Finland. It’s the best place in the world to witness the phenomenon of land uplift caused by the melting of the ice sheet during the last ice age. That is one reason why this area is one of the UNESCO Natural Heritage sites. Land masses rise there about 8 mm every year, which means that new shallows, reefs, islands, bays and lakes are popping up all the time, providing excellent living conditions for pike. The pike fishing is usually quite rewarding and you can go after numbers or size. Just make sure you know how to handle a fish with sharp teeth and you will have a great time catching them! If you’re lucky enough and the Baltic sea doesn’t freeze completely, there might be a good opportunity to fly fish in Finland even during the winter, targeting the searun brown trout swimming along the coast looking for food. At least in autumn and spring, it’s very popular to fish for searun browns, yet it sometimes seems almost impossible to find any. When you do find one, it’s more likely to be a big one that has been feasting on little fish. The Archipelago in the southwest of Finland is one of a kind and it is said to be the largest island group in the world. Many of the islands are tiny and they are located very close to each other. There are many truly beautiful places to look for sea trout. Remember to wear enough warm layers under your wading clothes so you will be able to stay in the cold water the whole amazing fishing day. There’s something special about wading trough the freezing cold waves, having a coffee from the thermos bottle when you need to warm your fingers and watching the sun go down at the horizon. Maybe some bite, but more likely nothing. Just the nature and you and a perfect day.